This is wonderful. So well arranged and the colors are beautiful. I could stare at this forever. This is gorgeous! It might even be on a par with Flock, methinks. I love the intent concentration on Sammy's face, and that Dean is breaking the fourth wall, looking right at us with such a cocky, Dean-like expression. Such a lovely composition and the colours are really nice too! All the muted warm tones are a nice contrast to the vibrant poppies and detail of the boys. I like how Dean looks directly at the 'camera', really draws your eye. The difference in their expressions are very interesting too, very in character! Dean seems so pleased and at ease whereas Sam looks a lot more focused and troubled. Oh, my. The colors, the details of their faces--Sam's hair and Dean's smirk--this is absolutely beautiful. Melancholy, yet I just want to stare at it for a long while! Look at this gorgeous art! Look at it! Oh, man, this is so gorgeous. I love the cloudy sky, the field, the jagged edges of the worn photograph. 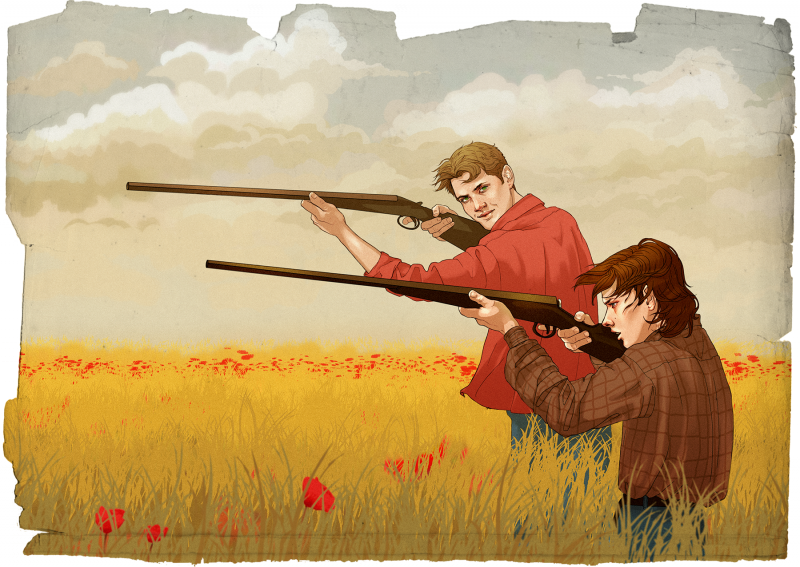 The windswept hair, their faces, Sam's seriousness. Everything about it is just fantastic, and exactly what I needed on a not-so-great day. Thank you so much! I love so many things about it--the coloring, the expressions, the wind, the whole concept of this version of "summer school." But I especially love the poppies. A great nod to fallen soldiers, surrounding them. And here the boys are, training to be soldiers in this supernatural war. Beautiful metaphor. So much to love, and I don't even know where to start! I adore the field and the poppies and the sense of a long hot summer starting to fade. I love Sam's focus and the delicacy of the hands on the weapons. As always you draw the best Sam hair ever and I love the style and the feel of movement from the wind. And I adore the way that our voyeurism into the moment has been caught by Dean looking right as us! Perfect! I also love love love the way you've captured their eyes; there's a sense of tiredness, or years beyond their age, like their already weary of the life and the summer. This is soooo good. My very favorite thing is their expressions. Dean staring straight at us and Sam and his wonderous young hair angrily staring down the barrel of his working summer break. Glorious. Those colors are gorgeous and the wind blowing their hair! Beautiful. I love, love, love the composition of this piece. Their expressions are fantastic too: Sam is concentrating so hard, the dear boy, and Dean is a lovely mix of instructive and proud of his little bro. A wonderfully melancholy piece! Oh wow, this is stunning. The earthy color palette is gorgeous, and I love the boys' expressions, and their wind-whipped hair. Also love the worn and torn framing of the scene. you! <333 i love weechesters and this is fantastic! YUP, that's the classic Winchester summer break. Beautiful colours, I can almost feel the breeze through my hair. Lovely job. So evocative - i can smell the summer and dry grass! Love Dean's pride and Sammy's concentration. This is so gorgeous - on so many levels. The red flowers pop out in the yellow fields perfectly. I can SEE the wind going through their hair. Dean's look, Sam's concentration - all spot on. The melancholy of a Winchester summer school. Just beautiful. Well done.